The region’s outbound M&A investment levels will grow faster than inbound, in part due to positive spill over from China’s Belt and Road campaign to boost cross-border trade but also as a result of local companies seeking to expand globally, our annual survey showed. 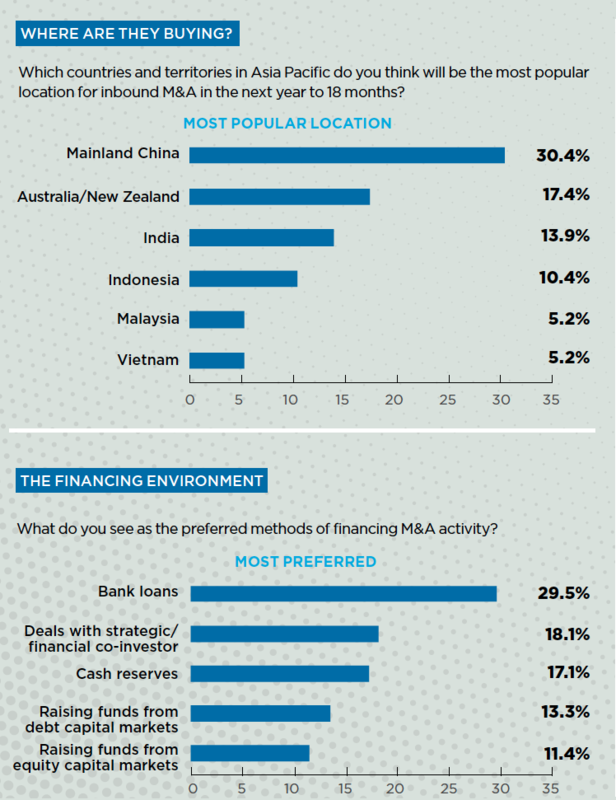 Executives, bankers, and investors polled in the M&A survey jointly produced by FinanceAsia and Clifford Chance are pretty sanguine about the likely amount of M&A business going forward, both inside Asia and beyond, but they expect a more balanced market between buyers and sellers. The survey also shows slower economic growth in China hasn’t dampened M&A sentiment there – whether for inbound or outbound deals. 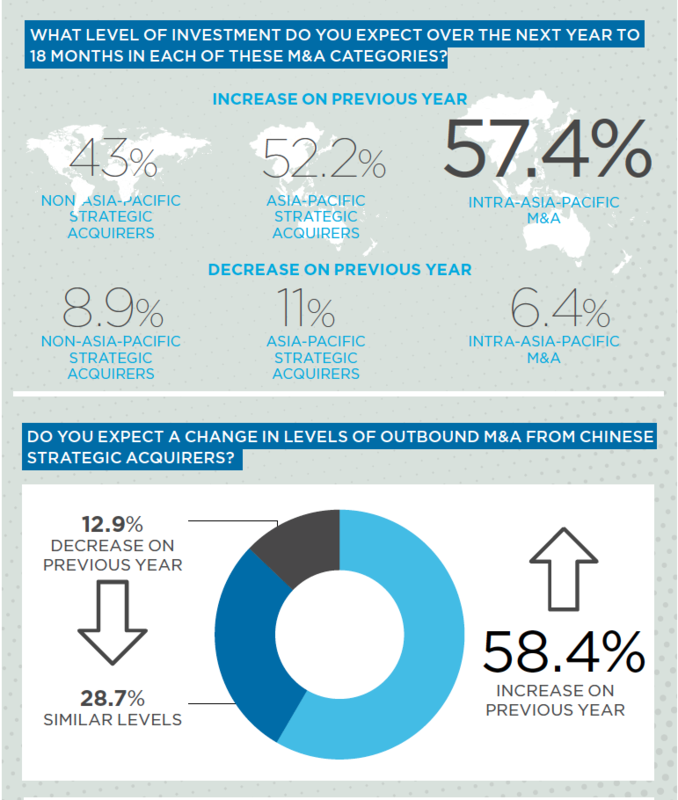 Some 58.4% of respondents expect higher outbound M&A levels from Chinese strategic acquirers over the coming year. 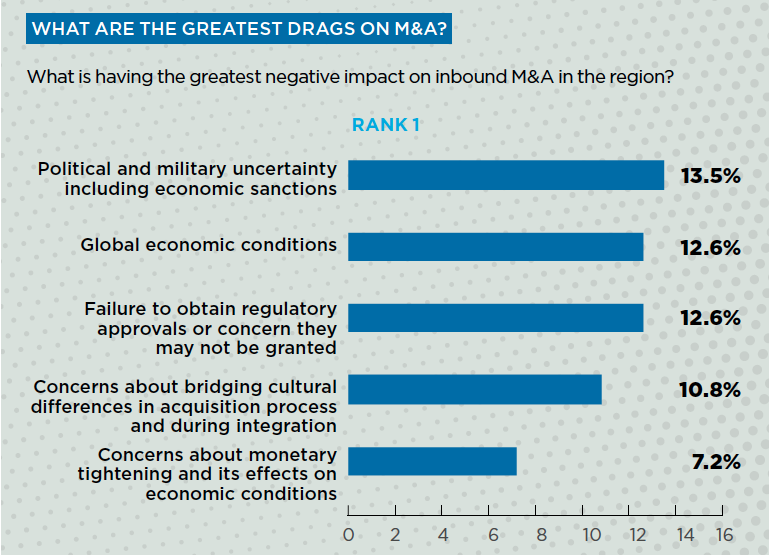 The survey of 145 banking, financial, and legal professionals shows participants are less worried about local protectionism dragging on inbound M&A in the Asia-Pacific than last year, but are a little more concerned about compliance issues, political uncertainties, and the challenge of gaining majority control of an asset. 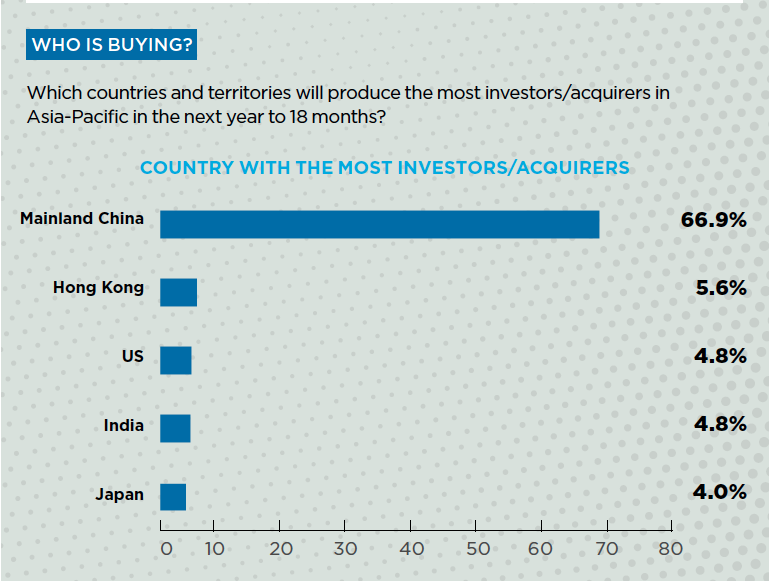 China, once again, is forecast to be the most popular regional destination for inbound M&A. The US remains the clear leader for Asia-Pacific companies seeking assets outside the region, buoyed in part by expectations that the world’s biggest economy will breach the 3% GDP growth rate for 2017 – a watermark not achieved in over a decade. One country that scored surprisingly low in the survey in terms of expected M&A activity was India. 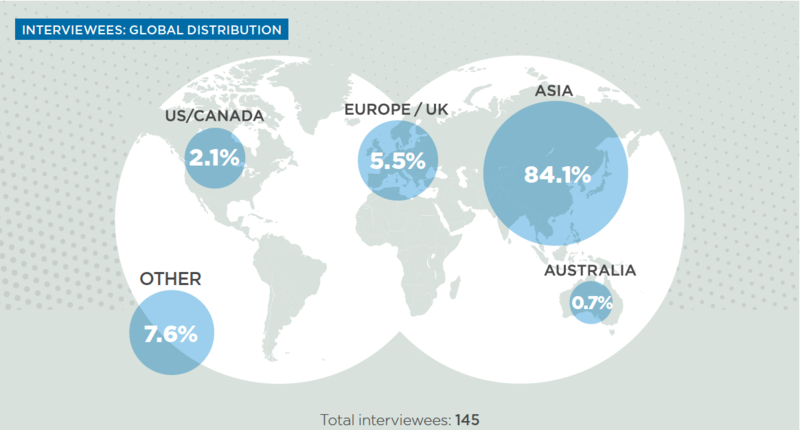 “India continues to increase in terms of flow and discussion. The level of discussion has picked up dramatically, both in terms of what owner families will think about selling or buying,” one investment banking head of M&A in Asia told FinanceAsia. “There has been a pick up in middle market family owned companies in India considering a sale,” he added. Since China’s return to the forefront of the global economic stage these past several years, Beijing has increasingly looked to expand its commerce and secure supply chains. With the Belt and Road initiative a year closer to linking China to Europe and Africa via the many ports of call and trading cities in between in renewed ways, we asked experts to weigh in on just how important the policy would be for M&A. Over 58% of respondents said it will have a “positive impact” on investment/activity levels in the markets involved, though 37.4% felt it was more talk than walk and are initially “neutral” on its upside deal-flow potential. Belt and Road is expected to cover some 68 nations. “Belt and Road is real as China is trying to export its excess capacity in railways, power, steel,” Bryan Koo, a consultant at Clifford Chance, said. The law firm advised China CITIC Bank on its purchase of a stake in Kazakhstan’s Halyk Bank. The Belt and Road transaction was signed in June during Chinese President Xi Jinping’s state visit to Kazakhstan. With backing from the Asian Development Bank or China Development Bank, it will now also be easier for a wider range of companies to access the funding required to make projects viable in areas like Central Asia, where there is a real need for infrastructure. “More deals will be encouraged by the plan,” Koo added. Although Beijing’s planners have occasionally been prone to hype, Belt and Road in tandem with MIC2025 (“Made in China 2025”, introduced in 2015) will help to offload the country’s excess capacity and upgrade its exports. Not only does China want to expand its markets by developing the long-overlooked potential along its ancient trading routes, with MIC2025 it hopes also to transform itself from world factory to world innovator, enhancing its brand cachet and technological know-how into the bargain. Of course, China’s top export market – the United States – is not along either the Belt and Road’s wet or dry pathways and remains the most popular single country for expected outbound M&A activity in the coming year, survey participants said. But the margin at 26.1% is down from 29.7% a year prior and is matched by expected intra-regional outbound M&A. That’s perhaps understandable given the increasing degree to which deals are being referred in Washington to the Committee on Foreign Investment in the US (Cfius) – a body that weighs control of US firms by foreign buyers against potential security concerns and is on pace to review a record volume of deals in 2017. Clifford Chance’s Koo also highlighted Beijing’s recent guidelines designed to ensure that Chinese companies’ acquisitions are value creating and not over leveraged. “An insurance company buying a nice hotel or football club, those types of transactions we do see less of,” said Koo. 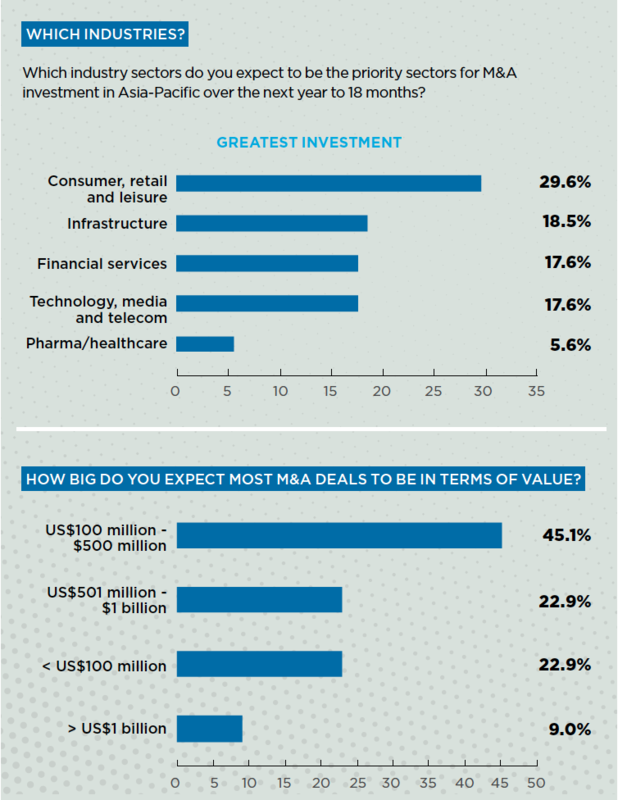 So in terms of large-scale outbound trends, while the survey is again quite bullish on M&A deals from Asia into the US, angst over rising protectionist sentiment in the US as well as pressure on some of China’s spendthrift tycoons to stick to their strengths may well curb the number of completed transactions. Also worth bearing in mind, deals in the US are looking increasingly expensive. “US asset prices are also high compared with five years ago,” noted Koo. Within the Asia-Pacific region, China still headlines as the top choice for inbound M&A over the next year, with 30.4% of those surveyed saying so compared with 26.6% a year earlier. Only 8.9% indicated that they expect cross-border M&A investment from non-Asia-Pacific strategic acquirers to weaken, with 68.3% anticipating an improved-to-unchanged lending environment to finance such deals. Private equity firms in particular are expected to pounce on any opportunities. ”PE firms have so much liquidity, or so-called dry powder, I would expect them to compete heavily in auctions,” Clifford Chance’s Koo said, particularly in developed markets such as Japan and Korea where they could acquire sizeable companies. With auctions heating up, prices will follow suit. Whereas a decade ago most of the leveraged finance deals would be conducted by international banks, these days Chinese and Taiwanese lenders are also active. Such competitive tension in auctions is pushing up valuations while the termsand conditions are loosening. So it is not surprising to see respondents inthe survey see the balance of power in negotiations becoming more evenly split after being 65% buyer-friendly last year. ”It’s a sellers’ market and I see it shifting more that way,” Koo said. Foreign companies are likely to continue to rethink their China strategies in the face of a gradual economic slowdown and fierce local competition. also Chinese owners of businesses,” said the head of M&A at an investment bank. Clifford Chance advised Coca-Cola on the sale of its bottling units in China to Swire and COFCO. The law firm also advised on the Taiwan-listed Ruentex’s $2.88 billion (HK$22.4 billion) sale of 36.16% of Hong Kong-listed Sun Art Retail Group Limited, one of China’s largest hypermarket retailers, to Taobao. Survey respondents forecast that M&A in the consumer, retail and leisure sector will continue to be very active into 2018. “It is also unlikely that China’s SOE reforms will attract a lot of international PE investors,” Koo said. Meanwhile, generational shifts will likely continue to prompt family owners in Hong Kong to hive off non-core assets for reinvestment offshore. “The trend would be for them to sell off real estate assets and then shift to international infrastructure-type assets,” said Koo. Clifford Chance advised MBK Partners and TPG Capital on their acquisition of Wharf T&T from Wharf Holdings. 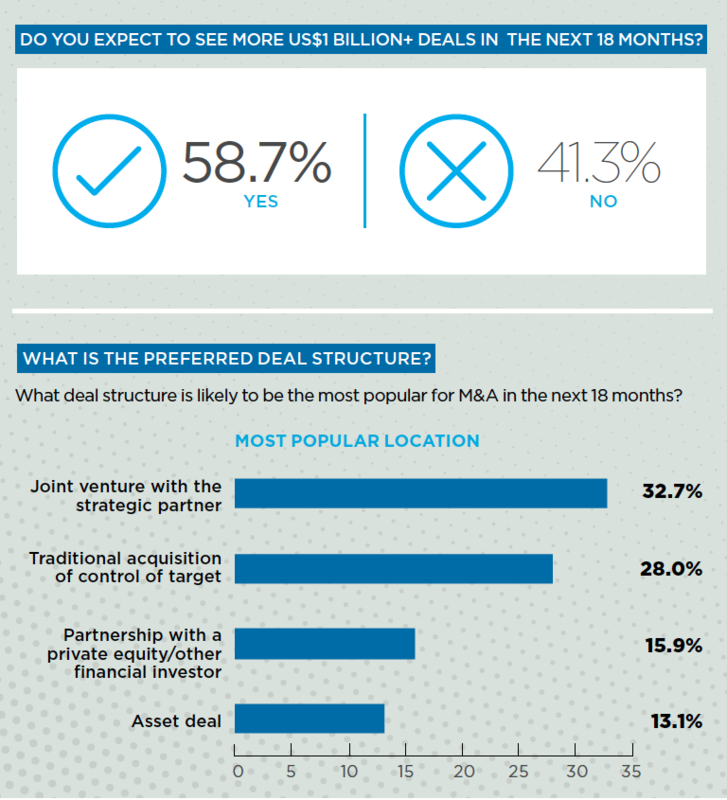 Given these potential destabilisers on the horizon, it is perhaps surprising that the majority of survey respondents look forward to a better year for M&A deal-flows. It helps that the global economy is enjoying synchronised growth for the first time in a long time.